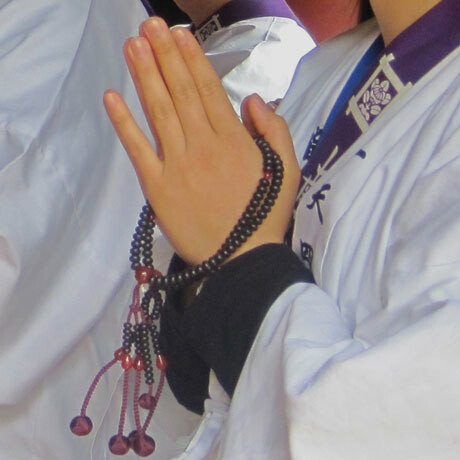 Prayer Beads are used by all Buddhists and by many other religions as well. These beads are called Juzu or Nenju in Japanese, Malaby the Tibetans. In Sanskrit they are called Japamala. When the Romans first saw prayer beads (Japamala) used by the Hindus, they mistakenly heard “jap” instead of “japa.” Jap in Sanskrit stands for rose. Translated into Latin, this turned into Rosarium, and in English as “Rosary.” The Juzu or Mala may have been the inspiration for the Rosary used by Christians and Muslims today. Different Buddhist schools have different uses for Juzu, but one of the main uses is for counting prayers or prostrations. It is also a symbol that identifies the carrier as someone who follows the Buddhist path. Each school of Buddhism has their own style of Juzu. Some are small for the wrist and others are large. The beads may be made of bone, crystal, Bodhi tree wood, bamboo, coral or any number of other materials. The number of beads varies but the most common is one hundred and eight. One hundred and eight represents the one hundred and eight earthly desires. 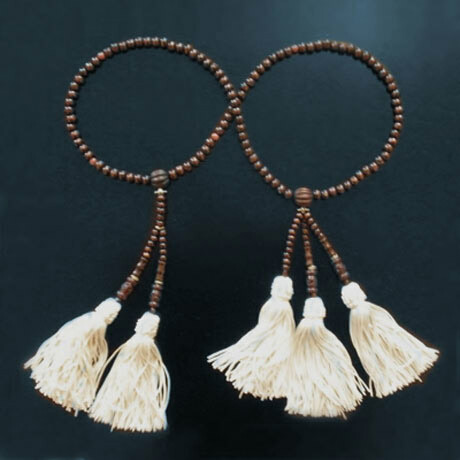 The Nichiren Shu Juzu has one hundred and eight beads in a loop with five tassels, three on one side and two on the other. Besides the one hundred and eight, there several special beads. Two larger beads represent Shakamuni Buddha and Taho Buddha. Four smaller beads in the main loop represent the four Bodhisattvas from under the earth. The Juzu also represents the individual. The tassels represent our head, arms and legs. This reminds us that we are made up of the one hundred and eight desires. There are several styles of Juzu used by Nichiren Shu. These styles vary in the tassels. The first is used by lay followers and has five tassels with balls at the end of each. The second is used by priests and has lace with tufts over the balls at the ends. The third has tassels like the first, but they are much longer. The third style is used by priests who perform special blessings, called Kito blessings.